In this article I'm going to show you some helpful shortcuts or ways to deal with the camera within Blender. This is merely a compilation of stackoverflow articles and own experiences, and should serve as an quick overview. 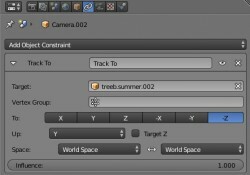 One common use case you'll learn is how to be able to quickly render different scenes on different camera settings. How can I make a camera the active one? 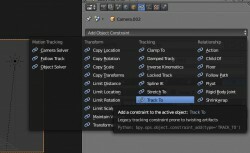 Useful if you just want to quickly render different scenes but with different camera angles. For that I have a scene in every layer plus a camera positioned the way I want the scene to be rendered. One of the most important shortcuts. Select the camera you want to reposition and press the above key combination. Violà! How can the camera look always at the object despite its position? This is really useful if you always want to point your camera in the same direction or track one object regardles the cameras position. That means no reposition of the camera if you move it. First select your camera, and in the property panel select the menu entry "Constraints" (two linking rings). 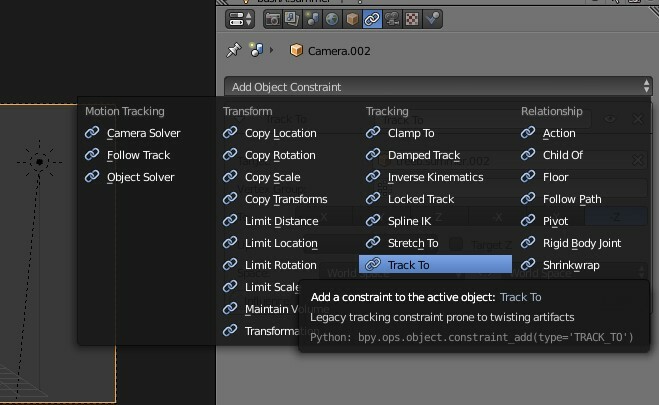 After that you click at "Add Object Constraint" and select "Track To". Then you select the pipette icon of the field "Target" and point the object in the 3D viewport you want to track. You can also select a target from the dropdown menu that opens when you click in the input field. 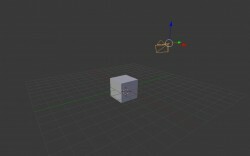 Don't forget to set the forward vector of the camera "-Z" and the up vector to "Y" as in the picture below.